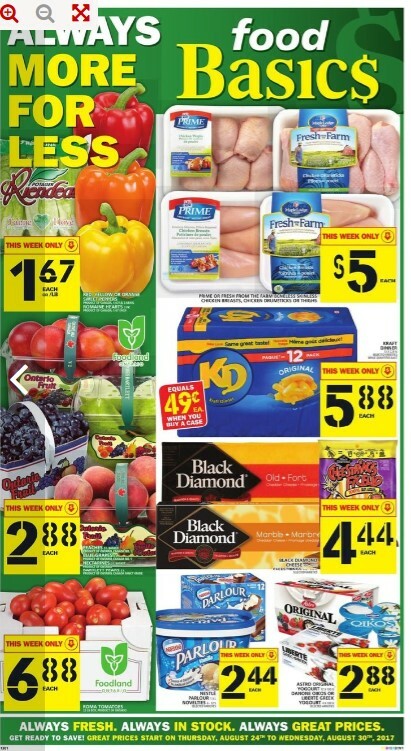 Food Basics Flyer toronto Valid Thu Aug 24 – Wed Aug 30, 2017. 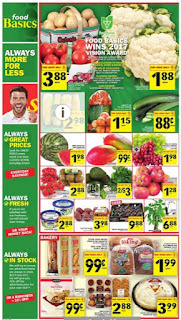 Check out this week Toronto Food Basics Flyer sales. Best price Latest Deals then get this week specials. Low cost grocery store flyers sales and Coupons. Explore Food Basics flyer, you will find Fresh produck, always in stock, great prices. Tropicana Orange Juice $3.99 - Price $1.50 Savings 1.65 - 1.75 l. Selected varieties. McCain French Fries Marche 2/$5.00 - Price Up to $2.58 Savings Mccain french fries 454 - 650 g marche 260 g, frozen selected varieties. Earth's Own Almond Fresh or So Good $3.49 - Price $0.50 Savings 1.89 L. Selected varieties. Old El Paso Kits Salsa $2.99 - Price Up to $1.80 Savings Old el paso kits 250 - 510 g salsa 650 ml selected varieties. 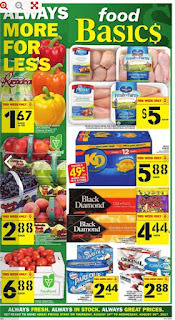 Black Diamond Slices $2.99 - Price 450 g selected varieties. Lactantia Purfiltre White Milk Natrel Lactose Free Milk $4.99 - Price Up to $1.00 Savings Lactantia purfiltre or natrel fine-filtered white milk 1%, 2% or scim 4 l natrel lactose free 2 l selected varieties. +more. Low price for Quaker Crispy Minis - Only Price 3/$5.00 100-199 g selected varieties. Snack Pack Pudding Cups - Price $0.99 Save $1.00 4's selected varieties. Christie Dad's or Peek Freans Cookies $2.99 - Price $1.00 Savings 256-350 g, selected varieties. Doritos or Ruffles 2/$6.00 - Price 220-255 g selected varieties. Selection Club Soda or Ginger Ale $2.99 - Price $1.00 Savings 12 x 355 ml selected varieties + more Food Basics product sale, this offers available on page 4. Lactantia Cream International Delight Coffee Whitener $2.49 - Price Up to $1.50 Savings Lactantia cream 5% or 10%,1 L 18% or 35%, 473 ml international delight coffee whitener 473 ml selected varieties. Liberte or Danone Oikos Greek Yogurt $4.99 - Price $1.30 Savings 750 g selected varieties. Kellogg's Rice Krispies General Mills Honey Nut Cheerios Jordans Morning Crisp $4.99 - Price Up to $3.00 Savings Kellogg's rice krispies 640 g general mills honey nut cheerios 685 g jordans morning crisp 450-500 g, selected varieties. Dr. Oetker Ristorante or Casa Di Mama Pizza $3.99 - Price $2.00 Savings 305-410 g, frozen, selected varieties. Minute Maid, Nestea, Tropical Grove or Oasis Drinks $1.99 - Price Up to $2.00 Savings 10 x 210 x 200 ml or 9 x 330 ml selected varieties. You are able to find fresh meat, fruit, vegetables, on this flyer. 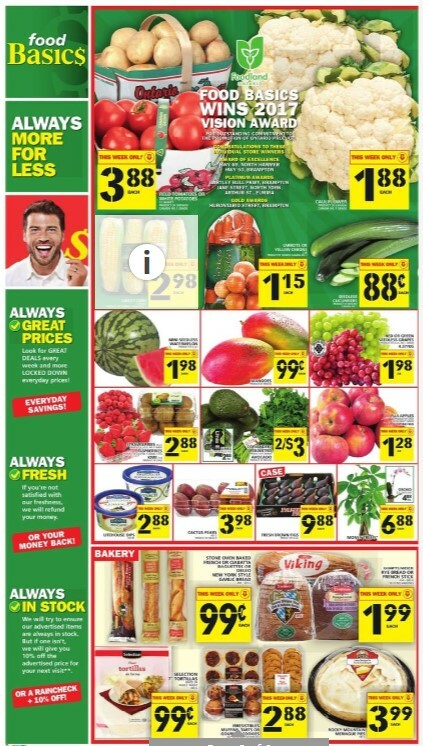 Don’t miss out grocery deals sale this week by clicking here Food Basics Flyer.